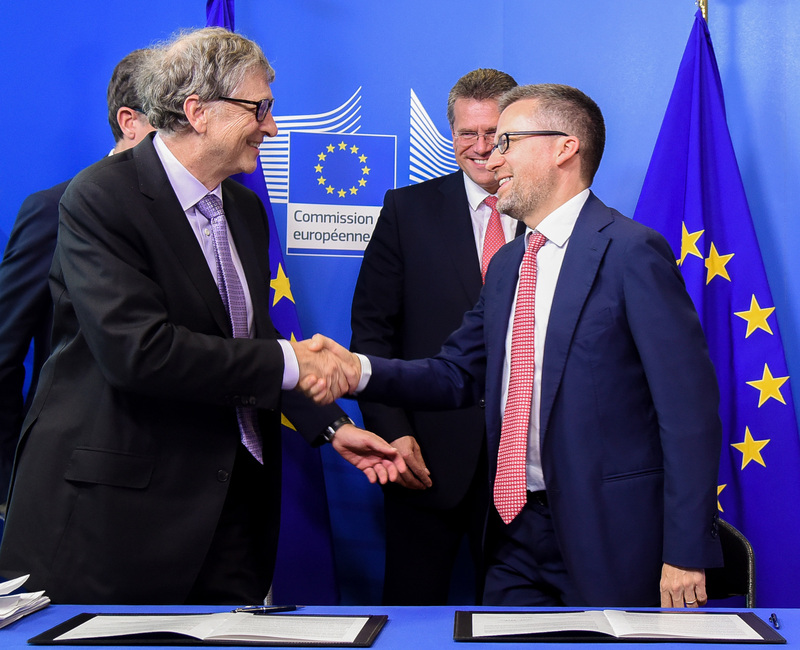 <h2>Bill Gates and European Commission launch €100 million clean energy fund</h2><br /><p>Speaking at the launch in Brussels, Belgium, on 17 October, Gates said that science and innovation hold the key to tackling climate change.</p> <p>‘My history at Microsoft made me an optimist, a believer in backing scientists to solve very tough problems,’ he said. ‘And here in Europe there’s an incredible number of scientists who’ve got good ideas.’</p> <p>The €100 million Breakthrough Energy Europe fund combines €50 million of public funding from the EU and €50 million in long-term risk capital from Breakthrough Energy Ventures, the Gates-led fund for energy startups. It will focus on technologies in the areas of electricity, transport, agriculture, manufacturing and buildings that reduce emissions by at least half a gigaton a year, as well as increase energy efficiency.</p> <p>Carlos Moedas, the EU’s Commissioner for Research, Science and Innovation, said: ‘We are delivering on our commitment to stimulate public-private cooperation in financing clean energy innovation. Together, we are opening up a new way of working for the future, one that will really make a difference.’</p> <p>Europe’s leadership in addressing the challenge of climate change is ‘more important today than ever,’ said Gates, who added that innovation was the answer to the question of how to double the amount of energy used over the next 50 years, while also getting emissions down to zero.</p> <p>When the Breakthrough Energy Europe team is up and running in 2019, they will sit down with universities and institutions across the continent to identify which research is ready to be turned into products. The aim is to invest the €100 million over the next two years and then potentially scale up the fund if it is successful.</p> <p> <div class="quote-view quotesBlock quote_horizontal"> <div class="quotesTop"><img src="https://horizon-magazine.eu/sites/all/themes/horizon/images/quotes_top.png" alt="" title="" /></div> <p>'Together, we are opening up a new way of working for the future, one that will really make a difference. '</p> <blockquote><p>Carlos Moedas, European Commissioner for Research, Science and Innovation</p></blockquote> <div class="quotesBottom"><img src="https://horizon-magazine.eu/sites/all/themes/horizon/images/quotes_bottom.png" alt="" title="" /></div> </div> </p> <p><strong>Hard-hitting</strong></p> <p>The fund’s launch comes in the wake of a hard-hitting <a href="http://www.ipcc.ch/report/sr15/" target="_blank" rel="noopener noreferrer">report</a> from the UN’s International Panel on Climate Change which said that ‘unprecedented’ changes would be needed in all aspects of society to limit global warming to 1.5˚C above pre-industrial levels.</p> <p>In particular, the report said this would mean ‘rapid and far-reaching transitions in energy, land, urban and infrastructure (including transport and buildings), and industrial systems’.</p> <p>Maroš Šefčovič, the European Commission’s Vice President for Energy Union, said: ‘The IPCC (said) that every bit of warming matters and urgent action is needed to limit global temperature rise. Let’s collectively act as clean energy innovation warriors to inspire others.’</p> <p>Scientists estimate that the world has already warmed by 1˚C since pre-industrial times as a result of human activities, and models show that, without action to cut emissions, global warming could exceed a <a href="https://horizon-magazine.eu/article/world-track-catastrophic-warming-forecasters.html" target="_blank" rel="noopener noreferrer">catastrophic 4˚C</a> by the end of this century.</p> <p>The fund forms part of the EU’s commitment to reduce greenhouse gas emissions in the European Union by at least <a href="https://ec.europa.eu/energy/en/topics/energy-strategy-and-energy-union/2030-energy-strategy" target="_blank" rel="noopener noreferrer">40% from 1990 levels by 2030</a>. The public-private financing model is a pilot project that could in the future be replicated in areas other than clean energy.</p> <p>In 2015, representatives from 195 countries met in Paris, France, and signed a <a href="https://ec.europa.eu/clima/policies/international/negotiations/paris_en" target="_blank" rel="noopener noreferrer">binding agreement</a> to limit global warming to well below 2 ˚C, and to aim for 1.5 ˚C. World leaders are due to meet again in December in Katowice, Poland, to look at progress towards this goal.</p> <p>The European Commission is also working on a proposal to decarbonise the European economy by 2050, which will be published in November and will feed into December’s discussions in Poland.</p> <p><em>If you liked this article, please consider sharing it on social media.</em></p> <br /> <img src=”http://www.google-analytics.com/collect?v=1&tid=UA-40077089-1&cid=bill-gates-and-european-commission-launch-€100-million-clean-energy-fund&t=event&ec=republish&ea=read&el=bill-gates-and-european-commission-launch-€100-million-clean-energy-fund&cs=republish&cm=republish&cn=republish&cm1=1" /> This post <a href="https://horizon-magazine.eu/article/bill-gates-and-european-commission-launch-100-million-clean-energy-fund.html">Bill Gates and European Commission launch €100 million clean energy fund</a> was originally published on <a href="https://horizon-magazine.eu/">Horizon: the EU Research &amp; Innovation magazine | European Commission</a>. Speaking at the launch in Brussels, Belgium, on 17 October, Gates said that science and innovation hold the key to tackling climate change. The €100 million Breakthrough Energy Europe fund combines €50 million of public funding from the EU and €50 million in long-term risk capital from Breakthrough Energy Ventures, the Gates-led fund for energy startups. It will focus on technologies in the areas of electricity, transport, agriculture, manufacturing and buildings that reduce emissions by at least half a gigaton a year, as well as increase energy efficiency. Europe’s leadership in addressing the challenge of climate change is ‘more important today than ever,’ said Gates, who added that innovation was the answer to the question of how to double the amount of energy used over the next 50 years, while also getting emissions down to zero. When the Breakthrough Energy Europe team is up and running in 2019, they will sit down with universities and institutions across the continent to identify which research is ready to be turned into products. The aim is to invest the €100 million over the next two years and then potentially scale up the fund if it is successful. The fund’s launch comes in the wake of a hard-hitting report from the UN’s International Panel on Climate Change which said that ‘unprecedented’ changes would be needed in all aspects of society to limit global warming to 1.5˚C above pre-industrial levels. In particular, the report said this would mean ‘rapid and far-reaching transitions in energy, land, urban and infrastructure (including transport and buildings), and industrial systems’. Scientists estimate that the world has already warmed by 1˚C since pre-industrial times as a result of human activities, and models show that, without action to cut emissions, global warming could exceed a catastrophic 4˚C by the end of this century. The fund forms part of the EU’s commitment to reduce greenhouse gas emissions in the European Union by at least 40% from 1990 levels by 2030. The public-private financing model is a pilot project that could in the future be replicated in areas other than clean energy. In 2015, representatives from 195 countries met in Paris, France, and signed a binding agreement to limit global warming to well below 2 ˚C, and to aim for 1.5 ˚C. World leaders are due to meet again in December in Katowice, Poland, to look at progress towards this goal. The European Commission is also working on a proposal to decarbonise the European economy by 2050, which will be published in November and will feed into December’s discussions in Poland.